Mazda Minagi | What Car? While the Minagi and Shinari concept cars on Mazda's stand may attract the most attention it could be Mazda's Skyactiv technologies that may have the longest-lasting impact after the show. More on Skyactiv a little later, for now let's concentrate on the concept cars. We've seen the Shinari but the Minagi is all new. It's an Audi Q5/Ford Kuga rival and although Mazda is sticking to the 'it's-a-concept-car' party line, this is likely to be the forerunner to the CX-5, a sporty crossover expected early next year. The Minagi uses an all-new platform and is the first concept car to incorporate Mazda's Skyactiv technologies ie lightweight and efficient engines, transmissions and bodywork. It also expresses Mazda's latest design philosophy, which it calls Kodo Soul of Motion and which shows how future Mazdas will look. Mazda says it is developing plug-in hybrid and electric cars but it firmly believes there's a long way to go in developing the efficiency of the internal combustion engine and traditional gearboxes that will produce dramatic reductions in fuel consumption and CO2 emissions. 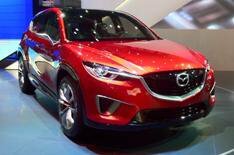 Skyactiv technology will feature in all new Mazdas. Mazda hopes to improve fuel economy across its range by 30% by 2015 using vehicles fitted with Skyactiv technology. It has a made a 165bhp 2.0-litre petrol engine that has the efficiency and pull of a traditional diesel engine. Theres also a 2.2-litre diesel engine that Mazda has targeted to have CO2 emissions of sub-105g/km, and insiders suggest that figure will in fact be lower. Mazda Skyactiv MT is a manual gearbox that is smaller and lighter than a traditional gearbox that 'ensures a shifting feel similar to that of an MX-5', says Mazda, but also reduces fuel consumption. Mazda has a Skyactiv six-speed automatic transmission that's 7% more efficient than its current five-speed auto.